Jesse Sene-Lefao, who scored two tries for Castleford Tigers against Leeds Rhinos. Picture: Tony Johnson. Castleford Tigers bounced back from their drubbing at Catalans with an equally convincing 42-10 victory over rivals Leeds Rhinos. In extending a winning run in league games against the Rhinos going back to 2015 Daryl Powell’s men moved back up to third place in the Betfred Super League. They had to come from 10-4 down after Leeds made a lively start, but with two tries from man of the match Jake Trueman and two by Jesse Sene-Lefao in the second half they ended up emphatic winners. Cas led 16-10 at the break after an entertaining first 40 minutes when both sides showed their attacking abilities from all over the field. The Tigers had a chance in the opening minute when the returning winger, Greg Eden, made a lightning break from his own 20. He chose to pass when within 30 metres of the visitors’ line, but saw the supporting Michael Shenton put the ball down. Within 30 seconds there was a similar break by Stevie Ward, but no mistakes this time as he sent Tom Briscoe racing over for a try that was converted by Liam Sutcliffe. 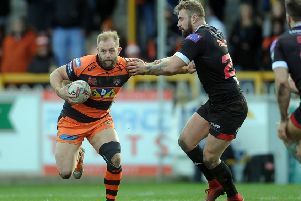 Back came Cas to score on six minutes when Ashton Golding lost the ball in a tackle 30 metres from his own line and quick as a flash Paul McShane and Jake Trueman moved the ball left for Eden to score on his first game back after injury. The hosts then failed to finish off a hatful of chances for another try as a knock-on from a high kick denied Eden, Shenton lost the ball near the line and Adam Milner lost control of the ball in a tackle near the line. Jesse Sene-Lefao was then held up over the line, but it was the Rhinos who scores next as Sutcliffe’s great late offload sent Briscoe sprinting away for his second score. Cas soon got back on top with Trueman’s kick forcing a drop-out and Jamie Ellis losing the ball on the line as he tries to drive over. A try finally came on 26 minutes when Shenton’s break scattered the visitors’ defence and they were still all at sea when Quentin Laulu-Togaga’e spotted a gap to race over. Ellis’s conversion made it 10-10. More home pressure followed with McShane’s kick forcing another drop-out and Ellis’s grubber bouncing nicely for Matt Cook to collect and charge over for a try converted by Ellis. It stayed 16-10 to half-time although the Tigers turned down a chance of a penalty goal in the last minute of the half. Junior Moors was held up over the line and in the last play Mitch Clark lost the ball trying to reach out to score. The first score of the second half was always going to be crucial and it went to the Tigers as Trueman capped his impressive display with a deserved try as his determined run took him over the line. Ellis’s conversion took the lead out to 12 points. Leeds were still in the game at this stage as they forced a couple of drop-outs and Ryan Hall dropped the ball over the line chasing Joel Moon’s grubber kick. But once they were back in attack again Cas stretched their lead further with Trueman selling a lovely dummy to open up a gap then racing through it for his second try. Trueman then turned creator with a nicely judged grubber to give Jesse Sene-Lefao a try 11 minutes from time. Sene-Lefao collected his second try four minutes later with a strong finish and Ellis put the finishing touches to a dominant second half Tigers display with a late penalty to make the final score 42-10. Scorers - Castleford: Tries Eden, Laulu-Togaga’e, Cook, Trueman 2, Sene-Lefao 2; goals Ellis 7. Leeds: Tries Briscoe 2; goal Sutcliffe..
Castleford Tigers: Laulu-Togaga’e; Clare, Webster, Shenton, Eden; Ellis, Trueman; Watts, McShane, Sene-Lefao, Moors, Millington, Milner. Subs: Milner, Massey, Cook, Clark. Leeds Rhinos: Golding; T Briscoe, Sutcliffe, Moon, Hall; Lilley, Myler; Oledzki, Parcell, Singleton, Ward, Ferres, Cuthbertson. Subs: Walker, Delaney, Mullally, Walters.